Use the code PCG to save 20% when you pre-order tickets for our London-based event. 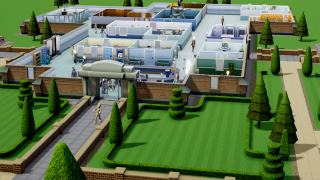 Two Point Hospital got a huge response when it was announced earlier this month. A modern spiritual successor to Theme Hospital is exactly what fans of the old Bullfrog games are looking for—and attendees of the PC Gamer Weekender on February 17 and 18 will be the first to see more of the game. Two Point Studios will take to the Developer Stage on the Saturday at 11AM to show off loads of previously unseen footage of the game, including a world exclusive gameplay reveal of a new in-game illness. Just in case that sounds serious, it's worth pointing out that existing illnesses in the game include having a lightbulb for a head ('lightheadedness'), evoking the diseases of the Bullfrog classic. Two Point co-founders Mark Webley and Gary Carr will be hosted by community manager Lauran Carter at the Weekender, and they'll discuss the inception of the studio from just an idea to their eventual deal with Sega to make Two Point Hospital. Those at the show will learn much more about one of the year's most exciting games. You can get tickets for the show here. You'll be able to play some of the best new and upcoming games at the Weekender, plus attend talks presented by some of the biggest developers on PC and much more. Ticket prices start at £12.99, and you can save 20% with the discount code PCG.